The Government of India has received Rs.10,78,006 crore (67.4% of corresponding BE 17-18 of Total Receipts) upto December 2017 comprising Rs.9,00,124 crore Tax Revenue (Net to Centre), Rs.1,13,498 crore of Non Tax Revenue and Rs.64,384 crore of Non Debt Capital Receipts. Non Debt Capital Receipts consists of Recovery of Loans (Rs.10,640 crore) and Disinvestment of PSUs (Rs.53,744 crore). 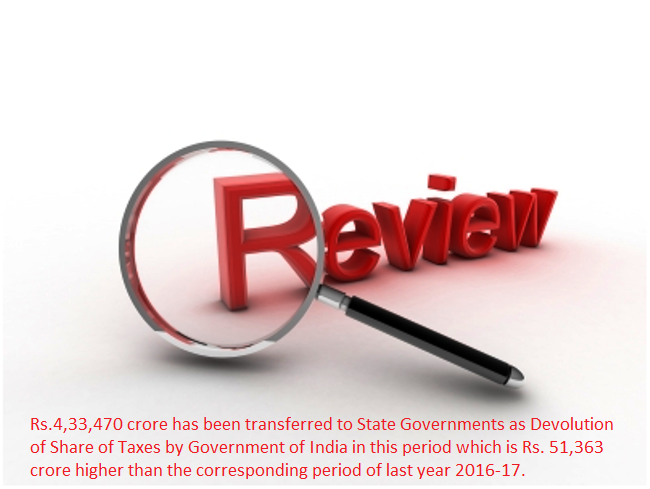 Rs.4,33,470 crore has been transferred to State Governments as Devolution of Share of Taxes by Government of India in this period which is Rs. 51,363 crore higher than the corresponding period of last year 2016-17. Total Expenditure incurred by Government of India is Rs.16,98,955 crore (79.1% of corresponding BE 17-18), out of which Rs.14,62,359 crore is on Revenue Account and Rs.2,36,596 crore is on Capital Account. Out of the total Revenue Expenditure, Rs.3,73,956 crore is on account of Interest Payments and Rs.2,14,845 crore is on account of Major Subsidies.